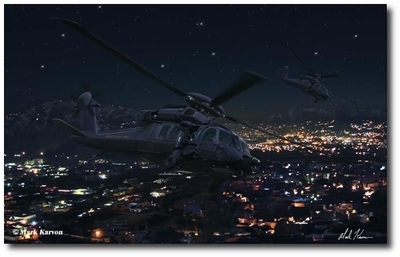 In the early morning hours of May 2, 2011, that promise was fulfilled when a CIA led operation with the 160th Special Operations Air Regiment and SEAL Team 6 raided the Abbottabad compound in Pakistan believed to be the hideout of Osama bin Laden. Two top secret stealth helicopters, believed to be modified MH-60 Blackhawks, were used to slip undetected into Pakistani air space. It was unlikely bin Laden heard them coming until they were right on top of the compound. The infamous terrorist leader was killed in the ensuing 40 minute raid. The helicopters used in the raid are top secret. They have not been revealed publically. The only clues we have to their appearance being the remaining tail section of one aircraft intentionally destroyed during the raid. 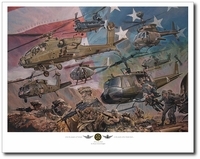 This print depicts Mark's interpretation of what those helicopters looked like inbound with SEAL Team 6 over Abbottabad moments before landing at the compound.